Pick of the Pops appeal – can you help? THE MAKERS of a new TV documentary on the UK singles chart are asking for help in locating lost episodes of Pick of the Pops. David Maguire, a researcher working on BBC Four television documentary ’60 Years of the UK Singles Chart’, which is due to be broadcast in November to celebrate the 60th anniversary of the chart, says he is very keen to hear from anyone who might have recordings of the BBC Radio chart show. He said: “I am a researcher working on a BBC Four television documentary ’60 Years of the UK Singles Chart’, which is due to be broadcast in November to celebrate the 60th anniversary of the chart. “A major focus of our programme is on how the charts were disseminated, and BBC radio programmes such as ‘Pick of the Pops’ played a very significant role in this. “I am trying to locate a copy of the first ever ‘Pick of the Pops’ programme broadcast by Alan Freeman in September 1961. I am also trying to locate a copy of Alan Freeman’s ‘Pick of the Pops’ broadcast in the first week of March 1967 when Englebert Humperdink’s ‘Release Me’ beat The Beatles ‘Penny Lane / Strawberry Fields’ to the number 1 spot. INTERNATIONAL FOOD group Nestlé is asking for help in plugging gaps in its archive collection in time for the 150th anniversary of Henry Isaac Rowntree beginning his world-famous chocolate empire. Alex Hutchinson, Nestlé’s heritage assistant, has already tracked down “hundreds of reels” of old film, but wants to find remaining lost footage so it can be made available to the public, and protected. According to The Press newspaper in York, she is particularly looking for a collection of time-and-motion films from the 1920s and 1930s, believed to have been taken away from the factory for safekeeping in the 1980s or 1990s, as well as the full-length version of a film made about the Yorkshire-based Dunollie rest home in 1947, and some advertising footage that was made for release in cinemas. Nestlé has been working closely with the Yorkshire Film Archive in recent years to make much of its old material available online. Recent additions include a film from 1932 that had been thought lost until Miss Hutchinson realised it had actually been mis-filed at the British Film Institute. Other finds include a 1958 film about fruit gums and their ingredients that was uncovered in an old scaffolding store, and a collection of more than 300 reels of film, some dating back to the 1920s, that was uncovered in a wall cavity in Nestlé’s head office in Croydon. TV RESEARCH organisation Kaleidoscope has announced the launch of its appeal to recover long-lost television and radio programmes. The purpose of the appeal is to get members of the general public searching through their attics, cellars, garages and sheds looking for home-recordings of otherwise lost shows. Until the early 1980s, broadcasters such as the BBC regularly disposed of archive programmes to re-use expensive tape and free up space. As a result, there are massive and significant holes in Britain’s television and radio archive. Countless hours of comedy shows, dramas, documentaries and other broadcasts have been lost, destroyed, or were never recorded in the first place. Though there have been campaigns to look for lost material before, such as Kaleidoscope’s The Raiders of the Lost Archives Appeal, these have always been very general searches. This time, the appeal is specifically targeting domestic home-recordings. We are looking for people who may have made domestic recordings of a TV or radio programme in their own home at the time of broadcast. Up until the 1980s, it was very common for people to make ‘off-air audio recordings’ of their favourite television or radio programmes. More often than not, a microphone would simply be propped up against a television speaker. There are even cases of programmes being taped on home video recorders as early as the 1960s and 1970s. These are the kind of things that we are looking for. The appeal, which is backed by the BBC and British Library Sound Archive will launch officially at Kaleidoscope’s “DJ Heaven” event in Stourbridge, on Saturday, June 4. Encouragingly, a number of exciting finds have already been made following a call to former broadcast engineers via BBC in-house magazine Ariel. Discoveries include audio recordings of seminal comedy shows such as Monty Python precursors At Last the 1948 Show and Twice a Fortnight, Broaden Your Mind, The Frost Report, The Ken Dodd Experience, The Morecambe and Wise Show, The Frankie Howerd Show, Not Only… But Also, World of Beachcomber, Till Death Us Do Part and many more. A specialist group of volunteers has been given the Herculean task of sifting through and preserving in digital format the huge amount of missing material that is expected to be uncovered over the course of the year-long appeal. Chris Perry of Kaleidoscope said: “We know for a fact that many people recorded their favourite shows off the TV and radio as far back as the early 1950s. “The purpose of the Treasure Hunt appeal is to uncover those domestic recordings and we ask people to search their homes for old reel-to-reels, cassettes and early video tapes that might just be sitting in the attic or cellar gathering dust. Anyone who can offer any recordings should contact Kaleidoscope via www.losthshows.com. A MUSIC enthusiast on the hunt for lost episodes of Colour Me Pop is appealing for help in tracking down the show’s director. Despite several leads, A. J. Smith says he has been unable to locate and get in touch with Steve Turner about the programme, which aired on BBC2 between 1968 and ’69 and showcased half-hour sets by contemporary pop and rock groups. In total, five episodes out of 53 remain intact within the BBC archive – The Small Faces, The Moody Blues, The Move, Trapeze, and an unscreened programme showcasing The Chambers Brothers. But Mr Smith, who is writing an article on Colour Me Pop, has been able to uncover soundtracks to episodes featuring Barry Nobel, The Hollies and David Ackles. He is now keen to speak to Mr Turner in the chance that he may have recordings of otherwise-lost editions of the show. Mr Smith said: “The CMP hunt goes slowly. The hunt really still hinges on locating Steve Turner, and I’m still none the wise on that front… I wish he didn’t have such a bloody common name! “Other than that, there’s not many other people to speak to, as the bandmembers (Peter Giles excepted, who was really enthusiastic and even wrote a letter to a BBC interior magazine to help me!) understandably don’t remember much, and CMP was a pretty one-man show, creatively. “I’ve tried tracing Steve Turner’s career post-CMP, but the trail runs dry at Central television on the mid-’80s. I have tried contacting people he would’ve worked with at Central, but heard nothing back. It was supplied by BBC sound engineer Michael Cotton, who worked on CMP and had also saved soundtracks to the Hollies and Barry Noble editions. Mr Smith added: “The soundtracks of quite a few editions (as listed on Wikipedia) are known to be at large somewhere. “I notice the Fleetwood Mac one has turned up on YouTube. The one I’m really after (as they’re my favourite group) is The Kinks audio. If you can assist A. J. Smith in contacting Steve Turner or finding missing episodes of Colour Me Pop, contact him at: khakishorts@gmail.com. READ ON: Wiped News speaks to pop star Barry Noble about the recovery on audio of his edition of Colour Me Pop. For more information on episode holdings for Colour Me Pop, plus links to soundtracks and clips, visit Wiped News’ Lost? page here. A RETIRED comedian is set to receive an extra special Christmas present this year after his son tracked down a recording of his one and only TV appearance. Kenneth Elcocks went under the stage name of ‘Kenny Windsor’ when he appeared before 10 million viewers on hit ITV talent show New Faces in 1975. The performance featured his favourite character, Farmer George, the Shropshire Lad, and earned the comic fourth place on the scoreboard for that week. It proved to be his only time on the box, however, and over 30 years later, funnyman Kenneth is yet to see his one moment in the spotlight. But that’s about to change thanks to son Lee, who secretly set out to find a copy of the show (tx 8/2/75) after discovering the mastertape had long-since been wiped. After only two months searching, the 32-year-old, from Telford, managed to find an old domestic recording in the possession of his dad’s former agent. The family now plan to surprise Kenneth, 73, with a DVD conversion in time for December 25th. Speaking to Wiped News, Lee says he left “no stone unturned” in his hunt for the episode. He said: “Dad has never seen a recording of the show as it went out on air. He said he would love to see it again but probably never would. It was then that I thought I would give it a go and try and get a copy. “I thought a simple email to ITV would do the trick but back in the early to mid-70s, both they and the BBC recorded over TV shows as tape was expensive. Earlier this month, he heard back from talent agent Bernie Lewis, who had kept a recording on a Phillips N1500 tape along with a “boxful” of promotional posters, photographs and other things. Lee is now looking forward to finally getting to see his dad on the small screen. “The tape has not been stored in an attic but in a cupboard in the house, so hopefully the recording will still be OK.
“I already have a contact who will convert it for for me, Colin McCormick from Video99, and I’m sure he will try his best. 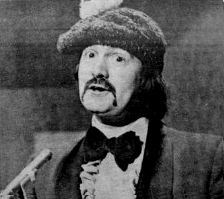 New Faces marked the first and last TV appearance of character comedian Kenny Windsor, though he continued to do clubs and pubs after the show for many years. According to Lee, his father’s low score on the night was down to a last-minute change of material. He said: “He had rehearsed four times during the day and everything was going well, but just before the main recording one of the staff at the show told him that he couldn’t do a major piece of the act, because the joke was not suitable for 6pm on a Saturday night! Lee added: “The winner of that nights show was a chap called Dennis D’ell, who back in the mid sixties was the lead singer in a band called The Honeycombs who had a number one hit with ‘Have I the Right? Lee plans to visit his father, who lives in Bath, on December 4th and present him with the DVD and memorabilia, along with a scrapbook about the quest to find it. “His old scrapbook now has the empty pages filled with every email and all the newspaper media he’s had recently but knows nothing about,” said Lee. In his hunt, Lee has also found an audio recording of another lost episode of New Faces, and now means to go on tracking down old episodes. He said: “I had a reply to one of my appeals that went out on ATV network from a chap who also appeared on New Faces, but had not got a copy. “The show, broadcast December 3, 1977, features the band he was in, Dry Ice, but it seems the episode is not in the ITV archives. “It turns out the man does, however, have an audio copy of the show, which is better than nothing. “My dad’s old agent has also said something very interesting. He had acts before and after my dad who also went on New Faces, and he has tapes of them all! Running between 29 September, 1973 and April 2, 1978, New Faces was famous for being a tough talent show . It was produced in Birmingham by ATV in front of a live studio audience and became notorious for regular panellist Tony Hatch’s scathing critique of some acts. Other regulars judges included Terry Wogan, Clive James, Noel Edmonds and Arthur Askey. Many early episodes have been lost including both Lenny Henry and Victoria Wood’s appearances, though VHS copies of these have since been located. The show was revived briefly by Central from 1986 to 1988 and hosted by former winner, comedienne Marti Caine. READ ON: The ATV News Network story can be found here. The story as it appeared in the Shropshire Star is here. WordPress blog Excerpts from a 70′s Teenage Rock Opera has a post sharing personal memories of watching New Faces back in the seventies. FOR A BRIEF but brilliant moment at the dawn of the 1990s, a new broadcaster emerged with the promise of high quality, high brow and high fidelity programming beamed down direct from the skies. BSB offered UK viewers original content across five homegrown channels, providing an important TV platform for future household names such as Alistair MacGowan, Chris Morris, Armando Iannucci, Steve Coogan and Chris Evans. Sadly, as TV historian Ian Greaves has discovered, precious little remains of the BSB archives. Together with the assistance of classic TV research organisation Kaleidoscope, Ian is slowly piecing together the fate of BSB material, seeking to recover as much of it as possible. WIPED recently caught up with Ian to talk about his project. You can read the feature here.